Something interesting happened to me this week finance-wise that I so badly wanted to blog about but I decided to just keep it between me and my girlfriend until I know more about it. I’m sorry, but I don’t want to jinx it. That little something got me thinking a lot of my finances and how easily I could get out of my current debt situation. I’ve read a couple of personal finance blogs and some people are in bigger finance troubles then I am at the moment. Therefore I should count my blessing that I woke up and smelt the coffee this early before a big disaster struck. Anyway, that’s not what I will be writing about today. 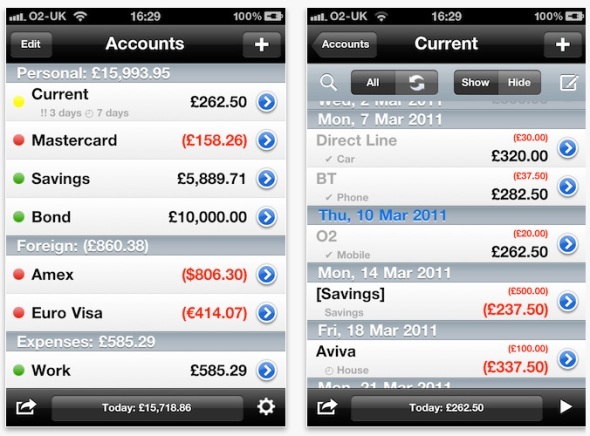 Instead I will be blogging about an app I use to keep track of my spending, income and savings (or lack thereof). The app I use is Account Tracker. Well I must say that I struggled to get into the habit of recording every transaction I make. I know I should not be spending everyday but it’s hard not to when you have to pay the cab driver in cash everyday (our public transport system doesn’t allow for other cheaper means of transport). In the beginning when I first bought the app for my iPod Touch 4th Gen back in November 2013. I just started working for my current employers and needed something to keep me focused on my finances. I would record the transactions in the beginning of the month when I still had lots of money. Until it got to like the midway point of the month and I totally lost interest because of the very low numbers on the screen. I was so afraid to look at my bank balance. It took me about five months to realize that my attitude toward money and budgeting need to change. I cannot be afraid of money. My money wouldn’t make it all the way to the end of the month. It got so bad one month I spent all my money in two weeks and I had no idea where it all went. Enough was enough. I was going to record every transaction I made and stick to my monthly budget. I’m proud to say that May and three-quarters of June has passed and I recorded every transaction I made. I haven’t stuck to my budget but at least I now know where the money is going to. So far the two places where I waste most of my money is beer and lunch. I learnt that I drink a lot of beer. Weekends I just want to unwind with at least one ice-cold beer and my friends and I usually catch up with each other at bar. We love beer. With lunch I am still a bit lazy to prepare my meals in the morning because I really love my sleep too much to get up earlier in the mornings. Bread, tomatoes and lettuce perish too quickly and I end up wasting them. My girlfriend and I have lunch together everyday and she usually doesn’t brown bag her lunch. So I don’t want to eat leftovers or sandwiches with her when she just bought something delicious from the grocery store. And lastly I get tired of salami/ham with cheese on bread very quickly. So thanks to the app I recognized the problem areas and all I have to do now is find a solution so that I can save some money there. That’s my post. I hope there is some development with the thing I mentioned at the beginning of the post so that I can share more about it. Until the next post, keep well.